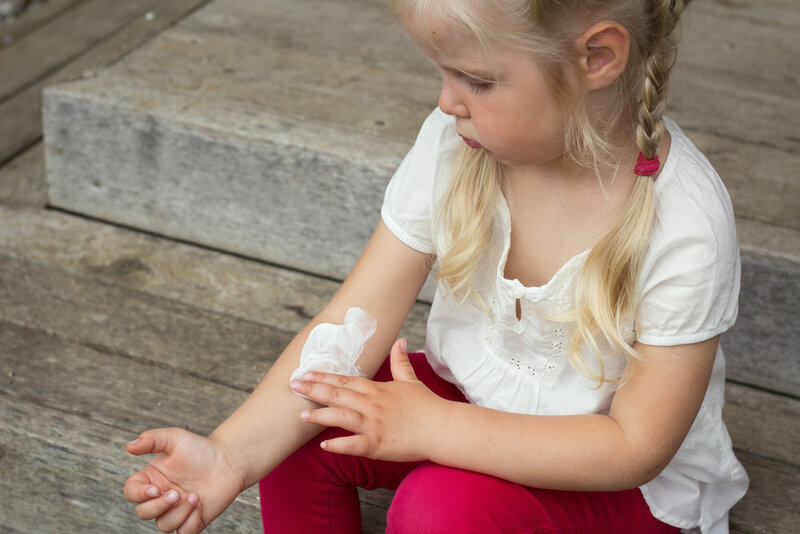 As a mama, having a little one who suffers from eczema can be excruciating! And this is typically true for both you and your little one. For those who don’t really have much experience dealing with severe eczema, they might wonder what the big deal is. Well, the answer to that is a big NO! I’ve been that mom with a child who was suffering from severe eczema. In fact, it had gotten so bad at one point when he was about a year-and-a-half old that he developed MRSA! Now, if you’re not familiar with what MRSA is, it stands for methicillin-resistant Staphylococcus aureus. This antibiotic resistant skin infection, if not treated properly, can develop into a more serious, life-threatening illness. The big problem is - it can be very difficult to treat. So you see, it’s not just a little skin rash. But scary things like MRSA set aside, it’s still no fun watching your child suffer through bouts of eczema outbreaks and other inflammatory skin conditions if they can at all be avoided. They’re itchy. They’re uncomfortable. Again, they’re just no fun. Before becoming a Holistic Health and Certified GAPS™ Practitioner, the only real solution I received from our pediatrician was to lather up a bunch of chemically-laden creams on the rash with the samples that were tossed at us as we left the medical office. And believe me…this was no REAL solution. There’s no avoiding the fact that the real solution to treating eczema and other inflammatory skin conditions is healing them from the inside out. Eczema and other skin rashes or irritations - whether it be psoriasis, rosacea, yeast and, yes, this can even include diaper rash - at their root cause are due to an unhealthy gut and imbalance of microbes in the gut and skin. Therefore, your first line of defense should always be to try and clean up the gut and get it back to a state of balance. Unfortunately, this can be a rather lengthy process for many and, if you’re anything like me, I know that you would LOVE some sort of natural remedy to help soothe the discomfort and itch - and possibly even speed up the healing time - associated with these uncomfortable rashes immediately! Tallow balm is a wonderful all-natural, nutrient-dense option for soothing and healing the skin. It’s safe. In fact, so safe that (minus the essential oils) you can eat it. And it’s completely compatible with the skin. I don’t know about you, but these sure seem like pretty compelling reasons to at least give tallow a try as part of a natural, skin care regimen. In addition to its compatibility with our skin biology, tallow has many benefits for general health and for skin health as well. So, the question is…are you ready to give it a try??? The beauty of this nourishing, lavender-tallow balm is that it doesn’t only have to be used on dry skin, eczema, or other skin rashes. It can just as easily be used as part of your daily skin care routine to soothe and moisturize the skin. It you prefer to buy tallow balm instead of make your own, these are my favorite options which you can find here and here. ** Essential oils are super concentrated, so use sparingly. Use only enough to give it a fresh, pleasant scent (as some find the smell of tallow a little unpleasant). ** Lavender essential oil is a good choice because it has traditionally been known to be healing to the skin, while also being calming to the mind. Really, any essential oil you desire can be used in its place for this recipe. NOTE: If using for your little one — please make sure to use an essential oil that is safe for children/babies. Gently warm & melt the tallow over low heat, then pour into a medium sized bowl. Mix in the olive oil & essential oils, then stir gently. Allow the mixture to cool for about an hour at room temperature or in the refrigerator. (This option will vary depending on your desired consistency). Optional: Whip with a hand mixture until to get a frosting-like consistency. Place in a clean jar & store at room temperature. Use as needed on rashes or simply as a nourishing moisturizer for your skin. Now it’s your turn, mama! Have you tried tallow balm or any other natural remedies to help soothe eczema or any other rashes you or your child(ren) were experiencing that worked well for you? I’d love to hear about your experience in the comments below.